Home / Event / Like No Udder Meets Fully Rooted: Vegan Kombucha Floats & Scoops! 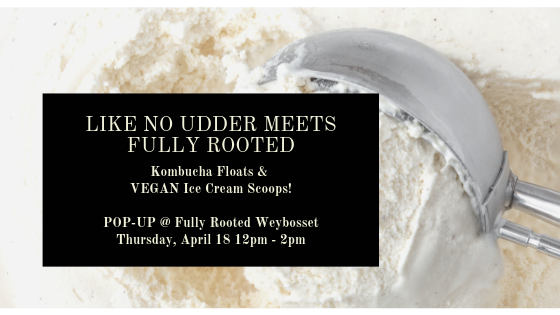 Like No Udder Meets Fully Rooted: Vegan Kombucha Floats & Scoops! Did someone say Vegan Kombucha Floats? Kick-off our 6th Birthday celebration with our favorite Vegan Ice cream Company, Like No Udder! Like No Udder will be popping up at our downtown location slingin’ scoops and concocting the most delicious Kombucha Floats with our signature crafted kombucha. If you don’t already know about Like No Udder, you’ll be delighted to know all their hard serve ice cream is handcrafted from scratch, using organic ingredients when possible, these ice creams may include cashew, coconut or peanut bases and are produced in Providence. They use a minimal amount of ingredients to bring to you the highest quality, tastiest, dairy free desserts.